"To Trafalgar Square! They need 4G!" Vodafone has confirmed that it will be switching on a new 4G mast every 30 minutes as it seeks to push out its new superfast signal. The Big Red Network was joint second to bring the new next-gen signal to the UK, along with O2, but some users have been checking the coverage tracker and been dismayed to note they can't get the 4G they're paying for. 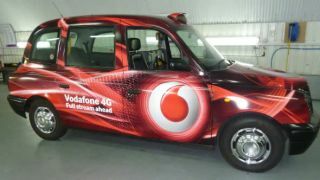 However, we spoke to Vodafone about this, and it says the 'planned coverage' element of the map (which promises a much more plentiful supply of 4G signal, both inside and outdoors) will be landing sooner that people think. A spokesperson for Vodafone said that a new site will be being turned on every 30 minutes, in order to make sure it's able to offer the 4G signal to as many people as possible. The spokesperson also told us that the network had thousands of people already signed up to its 4G plans before launch, thanks to the upgraded data and Spotify or Sky Sports services bundled in. Intriguingly, despite sharing sites across the UK, O2 and Vodafone's 4G coverage maps are telling different stories across the capital, with O2 seeming to have a greater coverage penetration despite not having the best 'type' of 4G (800MHz) for inner city use. We've spoken to O2 to find out just how fast it's managing to pull those big metal plungers (showering the room with sparks and causing people to duck… which is how we assume it's happening) to get 4G turned on as fast as possible across the UK. Yeah, but don't forget you can't use the iPhone 5 with 4G on Vodafone or O2.